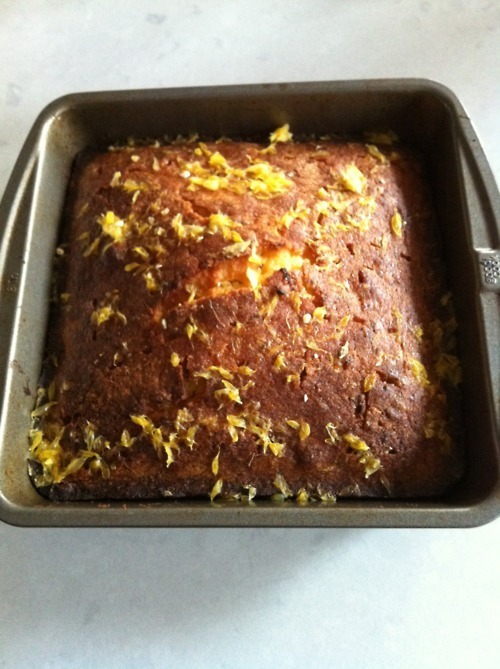 Orange Drizzle Cake for Afternoon Tea | Izzy have you eaten? So about this cake, Izzy. I am sending it to you because you know I have a mental block about baking. Nana gave me this recipe years ago, promising that even a nervous baker like me would get good results. Besides, it is so delicious! The rind of TWO oranges makes it so yummy and orangey. I also love thinking of you making it in Drummond Street, on another continent, having just made it here together with you. A snowy day, eating it at the kitchen table when Claudia and Dad got home, with steaming cups of tea. It is pretty nice to think of three generations of us cooking this cake in different countries isn’t it, my darling girl ? Pour the batter into a small greased pan and bake on 350 degrees for about 45 minutes or until cooked. Cool the cake, make slits with a sharp knife and drizzle with the syrup before serving. This entry was posted in GROUP C, Uncategorized and tagged Afternoon Tea, Cake, Orange by tgb9593. Bookmark the permalink. Pingback: Coconut Biscuits And Remembering Our Gourmand Alice | Izzy have you eaten?